These amazingly small and lightweight portable lithium-ion power packs, act as a charger, torch and will jumpstart a vehicle with a flat battery. Jumpstart suitable for a car with a flat battery with a starting current of 200A and a peak current of 400A. Also included are a range of connectors including vehicle aux, mains charger and a 4-in-1 device adaptor for phones, tablets, etc. This device can be used approximately twenty times on a single charge, is small enough to fit into a vehicle glove box and can start diesel engines up to 4-litres and petrol engines up to 6-litres. Prices start at £59.98. 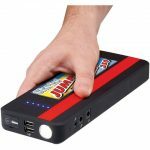 To view the full range of jump starts, click this link: https://www.machinemart.co.uk/c/clarke-jump-starts/ ENDS. Print article This entry was posted by admin on November 2, 2018 at 10:30 am, and is filed under News. Follow any responses to this post through RSS 2.0. Both comments and pings are currently closed.